It's not quite the control panel of the Fantom G8, but the FA08 still offers plenty in the way of hands-on control. Roland have condensed their considerable synthesizer workstation expertise into a single, affordable instrument. For the past decade or more, Roland's flagship workstations have been large, heavy and imposing, and replete with big knobs, long faders and, more recently, large touch-sensitive screens. Everything about them has screamed, 'I'm the real deal'. Yet here I am, sitting in front of the new, top-of-the range FA08, and it boasts none of those attributes. It's small, it's light, and it's constructed from plastic. There are no faders (long or otherwise), its screen is small and insensitive, and it looks like nothing so much as a stage piano with some extra features thrown in. Can it really replace the mighty Fantom G8? Physically, the FA08 foregoes the classy aluminium extrusions and space-age cheeks of the Fantoms, and it also lacks the sleek good looks of the long-defunct JV1000 and XP80. Furthermore, the plastic inlays that cover the screen and surround the controls already looked like someone had attacked them with a Brillo Pad when I received the review unit. But let's be fair, the new model doesn't cost as much as its predecessors and, at least in part, its lower price has been achieved by cutting hardware costs. Consequently, the FA08 lacks many of the controllers found on more expensive workstations. In addition to the left/right/push joystick and two buttons, it offers just six knobs (each with four possible functions, only one of which is programmable) plus 16 pads. Then there's the colour screen. Roland describe this as "large”. That's daft. To be fair, the clarity is superb, but it's only a five-inch device of unspecified resolution. You can trace the evolution of Roland's PCM-playback synth engines in a smooth arc, starting with the U110 in 1988, to the JV/XP-series, then to the XV-series and then to the Fantoms. But more recently, Roland have developed their SuperNatural Synth and SuperNatural Acoustic engines (the latter of which is an umbrella for a range of physical modelling sound generators), and it's the combination of PCM-based synthesis and the two SuperNatural engines that forms the basis of the FA08, as it did the Integra 7 rackmount module. (See SOS, February 2013.) But the new workstation isn't an Integra in a keyboard. The module offers 256 SuperNatural Acoustic Tones and 1109 SuperNatural Synth Tones, 26 SuperNatural Drum kits, and six 'virtual' expansion boards — five containing a total of 108 additional SuperNatural Acoustic sounds, and one with seven additional effects for the SuperNatural Drums — plus all 896 of the XV's preset patches, all of its drum kits, 12 SRX boards and a high-resolution GM2 expansion pack with 512 additional PCM-based sounds (phew!). In contrast, the FA08 offers... well, at first sight I wasn't sure what it offered. So I downloaded the Sound List and found that the factory sounds comprise 100 SuperNatural Acoustic Tones, 1115 SuperNatural Synth Tones, five SuperNatural Drum Kits, 897 of the XV's preset patches, 56 PCM drum kits, 256 GM2 tones and nine GM2 drum kits. Most significantly, this means that the FA08 has lost more than half of the SuperNatural Acoustic tones and the 12 SRX boards in ROM that make the Integra 7 such an attractive proposition. But to redress the balance a little, you can download and import Integra 7 patches from Roland's Axial sound library, and you can also import libraries of PCM waves and sounds into two Wave Expansion Slots. Within the boundaries of this reduced sound set, the FA08 exhibits the strengths (of which there are many) and the weaknesses (of which there are a handful) of its immediate predecessors. So, for example, the flagship 'Full Grand 1' patch still exhibits the rapid transition from mf to f that was a characteristic of the Roland RD800 that I reviewed a few weeks ago. Another? You can only adjust the drawbars of SuperNatural organs in an edit window, and they still suffer from the lack of a dedicated Hammond chorus/vibrato, which is astounding. Nonetheless, many of the SuperNatural Acoustic sounds are superb, and SuperNatural Synth is an excellent VA capable of a vast array of multi-layered analogue (and analogue-style) sounds. Ultimately, it would be daft to imply that the FA08 sounds anything less than first-rate and, once you get your head around its unconventional sound engines and their limitations, editing proves to be surprisingly straightforward. You can combine sounds in a Studio Set, which is a 16-part 'Performance' that does what you would expect in the usual fashion. However, there is at least one way in which it's superior to the Performance structures found on earlier generations of Roland's instruments. I'm a big fan of multitimbral effects and, if I want to chorus my Strat patch while torturing a lead synth, at the same time playing an organ through a rotary-speaker effect and gating my snare drum, I expect modern instruments to allow me to do so. The effects structures of earlier generations of Roland workstations were, for the most part, rather limiting, and certainly inferior to the larger and more flexible architectures of (for example) the Korg Trinity and OASYS. Happily, each of the Parts (a Tone in a slot) in a Studio Set now has its own MFX effects unit and three-band EQ, while a Drum Part can have an MFX/EQ combination or up to six compressor/EQ pairs. Following these, there's a global chorus and reverb, your choice of an IFX (insert effect) or a master compressor, then a master EQ and, finally, a TFX (total effect). It would be nice to have multiple MFX slots per Part — you'll find yourself wanting to chorus, delay and overdrive that Strat sound — but, at this price, the FA08's architecture is more than passable. In addition to the 67 MFX types quoted in Roland's literature, number 68 is a vocoder. This provides no control over frequency bands or gains, but allows you to mix the original with the vocoded signal for your Jon & Vangelis impersonations, and to apply chorus and reverb to the output to create a pleasing vocal wash. Be aware, however, that there's no XLR microphone input, which might leave you scurrying to find a beaten-up Shure Unisphere when you would prefer to be using your Neumann U47. Finally with respect to effects, it's worth noting that, despite its similarity to the Integra 7, the FA08 lacks Roland's Motion Surround effect, which allows you to position each Part in a 'fake' soundfield. Although it's easy to pigeonhole Motion Surround as appropriate only for 5.1, the RSS algorithms on which it's based were originally developed for two-channel playback and, indeed, the Integra 7 supports this. Consequently, a two-channel version could have been included in the FA08. But it wasn't. The FA08 offers a powerful arpeggiator that, at first sight, offers all of the usual functions: hold, octave range, note order, and so on. At second sight, it provides much more. As well as offering 128 preset styles and the ability to save 16 user styles, there are variations available for each, and you can import SMFs (Standard MIDI Files) of up to 500 events to use as arpeggios. You can even import a MIDI track from your current song and use this as the basis of an arpeggio. Then there's chord memory, which allows you to play and strum chords with a single key, and rhythm patterns, which offer intro, verse, chorus and outro options, rhythm groups of up to six patterns, and the ability to create new patterns from SMFs (this time, up to 4000 events long!) and from the drum track within the current song. That's a huge amount of compositional and doodling power. Moving on, I have to admit that I'm not usually a fan of workstations' sequencers. I don't know why but, for some reason, they don't match a fully featured software package, a huge library of plug-ins, a pair of 24-inch high-resolution displays, and the ability to draw modulation curves directly into tracks... Ah, I think that I've just answered my own question. Consequently, I wasn't concerned that the sequencer in the FA08 is a step down from those in more expensive alternatives, nor did it bother me that it doesn't record audio. But I quickly found that it works well as a MIDI scratchpad. In fact, it works brilliantly well, and I would venture that you can jot down ideas as quickly within the FA08 as anywhere else (if not quicker). You can even allocate a track to replay the samples you've allocated to the pads, either to create complete tracks from pre-recorded stems or to spin in audio and effects. What's more, you can import SMFs as songs, which explains why the FA08 contains those GM2 sounds and kits. Unfortunately, one of the promised functions is not what it seems. Export allows you to save a song as an SMF, as a stereo mix in WAV format, or as individual tracks in WAV format. Exporting audio takes place in real time, so you'll have to wait over an hour to export a four-minute song comprising 16 tracks, and none of the samples used are exported with it, so you could end up wondering what's happened to the things that make your creation the masterpiece that it is. But that isn't my major gripe; it's this rather naughty statement from Roland: "The FA08 also includes a high-speed USB audio interface, cutting down on clutter and making it easy to get your music into your DAW — especially since you can now export 16 tracks of WAV audio simultaneously.” Both parts of the quote are true, but the implication is not: you cannot export directly to your DAW, only to an SDHC card inserted into the FA08 itself. Nor can you access the audio from your Mac/PC after it has been exported unless you remove the card from the synth and insert it into the appropriate slot on your computer. Does yours have an SD card slot? Mine doesn't. The first thing that's apparent on setting up the FA08 is its weight. Or, rather, the lack of it. It may have the lines of a '70s Volvo but it weighs just 16.5kg (compared with 33.6kg for the Fantom G8) which makes it extremely manageable. Inevitably, the 'feel' isn't as robust, but the knobs, buttons, pads and spin wheel are solid and reassuring in use. Switching on the FA08 is a rare pleasure because, in stark contrast to the minutes required by some other workstations, it takes just seconds to initialise. Having done so, you can navigate its sounds quickly, and I particularly liked the ability to set up sequences of favourites for live use. As for the sounds themselves, I've already affirmed their quality but, as on the Integra 7, its 128-note maximum polyphony might prove to be a bit limiting when sequencing layered sounds. Expect a little note-stealing if you don't plan ahead. If I have a concern, it centres on the 'ivory feel' keyboard. This was designed for digital pianos, so one can't expect it to respond like a semi-weighted unit such as that installed in the otherwise identical FA06. Nonetheless, I was surprised to find that its response is too slow for sequencing fast hi-hat rhythms in real time. Of equal concern on an instrument that boasts 'Advanced Live Performance Features' is the lack of aftertouch. Sure, you can program aftertouch within sounds, and you can generate the appropriate MIDI message using the control pedal inputs, buttons S1 and S2, and any of the six knobs. But you can't press down harder on a key to generate it. Doesn't that rather defeat the purpose? Happily, the FA08 retains MIDI Visual Control and V-Link although, for some reason, Roland UK doesn't mention this within its product pages. I dream of being able to afford a 20,000-lumen V-Link projector, so I hope that Roland's reticence isn't a sign of things (not) to come. On the other hand, the company mention the D-Beam. Strange priorities. Roland's marketing for the FA08 begins, "Until now, keyboard workstations have typically been difficult to use to their full potential, slowing down your musical inspiration with confusing features and complex interfaces.” That's odd. The company have promoted themselves since 1988 as leading manufacturers of keyboard workstations, yet they're now telling me that many of the things they have exhorted me to buy for the past 26 years have been confusing and overly complex. What's more, the blurb tells us that the "new FA series completely reimagines the music workstation”. That's worrying. 'Reimagines' is a word used by the film industry to tell you that it has run out of ideas and is recycling an old one, usually with crushingly disappointing results. So, to summarise, my JVs, XPs and Fantoms were confusing and overly complex, and they're being replaced by something embodying a bunch of recycled ideas that may be as poor as the 2001 remake of Planet Of The Apes. Of course, that's nonsense, and it's misleading on at least two counts. Firstly, I have gigged extensively with a JV1000, an XP80 and a Fantom X7, and they have all been excellent instruments. Secondly, the FA08 is way better than the 2001 remake of Planet Of The Apes. The daft thing is that the company have a much better story to tell. So let me do it for them. For the first time, Roland's engineers have added a powerful sequencer as well as an SP-style sampler to the combination of their XV and SuperNatural sound engines. They have then eschewed everything that might have added to the price and presented the result as a low-cost instrument that can be carried under one arm. It has limitations of, course — things such as the restricted I/O and the nature of the sampler mean that it wasn't designed to replace the Fantom G8 or compete with the likes of the Korg Kronos 88 or the Yamaha XF8 — but it provides stiff competition for the Yamaha MOXF8, and even gives Korg's Krome 88 a damn good run for its money. Clearly, Roland have come up with a unique package of features for a rather attractive price. Now, why didn't they say that? 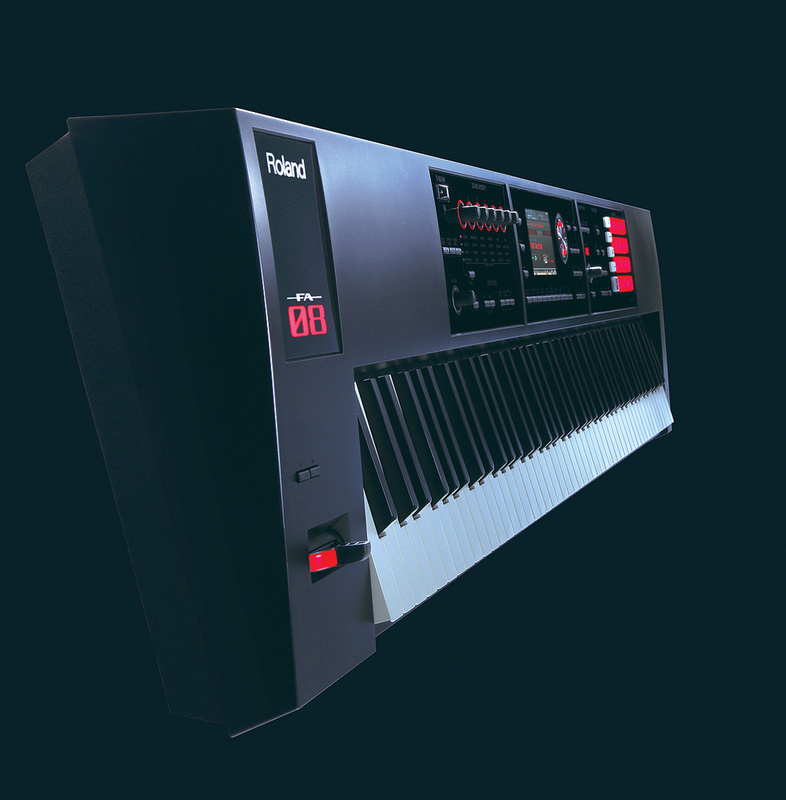 At the time of writing, there are three expansion libraries available for the Roland FA08. Strangely, once you've obtained the data, you then have to use a USB memory stick to transfer the downloaded files to the FA08, even when your synth and computer are talking to each other over USB for other purposes. I was excited when I saw the legend 'Sampler' on the FA08, but this feeling turned to bemusement when I investigated further. Before sampling, you have to allocate a bank (1 to 4) and pad (1 to 16) to which the sound will be saved. Having done so, you can sample from the analogue and USB audio inputs as well as any on-board keyboard performances (so far, so good) with auto-triggering (also good) in mono or stereo (better), and even import existing WAV, AIFF and MP3 files as samples. Once on-board, you can then truncate these and loop them and then... umm, well... nothing. You can play a sample from the pad to which you saved it, and perform housekeeping tasks such as moving, copying and renaming samples, but you can't use a sample as the basis of a sound mapped across the keyboard. As for things such as multisampling, filtering, and otherwise shaping the sounds... forget it. The FA08 may be ideal for DJs who punch buttons to fire one-shot samples, and it will be superb for Pink Floyd tributes that need to trigger the sounds of cash registers, barking dogs and Irish doormen. But, while it's great fun, it isn't a workstation sampler in the conventional sense. The low-cost approach to design is evident on the FA08's rear panel. With just a single L/R stereo output pair, it's not designed to output individual parts, although a single, monophonic Sub output allows you to direct a specified Part or a click track to a third destination. Alongside these, there's a single, unbalanced quarter-inch mic/line input, plus a stereo 3.5mm line in. Three inputs — sustain, plus two expression/switch pedals — provide analogue control, while five-pin MIDI is available in just In and Out flavours. Three digital holes are provided for the USB/computer connection, for uploading sounds from a USB memory stick, and for an SD memory card. Roland trumpet the DAW integration of the FA08 and, once you've downloaded and installed the appropriate driver, there are two elements to this. Firstly, you can use the FA08 to control a limited set of functions within your DAW. Templates are provided for Logic, Cubase and Sonar, and you can set up a number of parameters for other systems. But don't get carried away: you can only use the transport controls and assign 16 further functions to the buttons and knobs, so this control is far from all-encompassing. Secondly, you can use the FA08 as a bidirectional audio/USB interface. You can pass incoming audio through a noise gate and reverb, which is pointless if recording to a DAW, but handy if using the FA08 as a guitar/vocal scratchpad. With so much emphasis placed on integration, you might be wondering whether there's an editor that would allow you to use the FA08 as an 'external plug-in' within your DAW. There isn't, but it would be nice to think that Roland's engineers were working on one. The sequencer is excellent for jotting down ideas quickly. It offers a good complement of effects and effects slots. It offers few real-time controllers by modern standards, and lacks aftertouch. Exporting audio from the sequencer is slow, and you can't export directly to your PC/Mac. You can't construct mapped sounds from samples. A larger screen would be welcome. Roland's latest workstation is a competitively priced instrument rather than a state-of-the-art monster. It offers first-rate sound quality and an excellent 'scratchpad' sequencer, housed in a physical package that shows evidence of numerous cost savings in areas such as controllers and I/O, most of which are sensible, and one or two of which are frustrating.